The European People's Party (EPP) passed at its Congress in Bucharest on Thursday October 18th, 2012, a Resolution on the Responsibility and Protection of Genocide Prevention, which is based on an initiative by the Institute for Cultural Diplomacy. The EPP's resolution calls for a special EU Committee for the prevention of mass atrocities and for a more effective implementation of anti-genocide commitments. 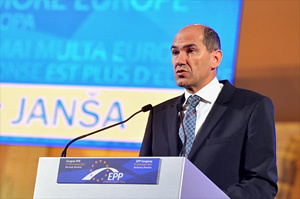 Please find below speech by Mr Janez Jansa, the ICD Genocide Prevention Initiative Chairman for the EPP plenary session of 18th October in addition to the EPP resolution. The Slovenian Democratic Party (SDS) would like to present to the distinguished delegates and guests at the upcoming EPP Congress the Resolution on the Responsibility to Protect and Genocide Prevention. Despite all the instruments at our disposal, the international community has been unable to assure a World free from Genocide. After World War II, more than 80 countries witnessed mass atrocities and at least 53 million innocent lives were lost. However, the abovementioned Initiative is a future orientated Initiative. It has no intention on clearing up the past and digging in the complex history of countries and nations around the world, but rather concentrates on preventing senseless bloodsheds in the future. We fully believe that we have the opportunity as well as an enormous responsibility to prevent such tragedies. We need a fast-track and concrete legal resolution to halt acts of genocide taking place across the world, as a continuation of the historic and invaluable work of the Polish lawyer Raphael Lemkin. The EU, this year's Nobel Peace Prize Laureate, has the necessary legitimacy and the international influence to contribute its share of responsibility to this noble endeavour. The President of the SDS, Mr Janez Jan?a, has undertaken a number of activities to raise awareness of the international community regarding the Responsibility to Protect and Genocide Prevention. Most recently, he addressed the 67th regular session of the United Nations General Assembly held in New York in September 2012 (http://gadebate.un.org/67/slovenia). He also chairs the Initiative on the Convention on the Prevention and Punishment of the Crime of Genocide within the framework of the Berlin-based International Institute for Cultural Diplomacy (www.culturaldiplomacy.org) since 2010. Therefore, we would be honoured if the Political Assembly of the European People's Party participated in this process by proposing to the Congress the adoption of the following Resolution on the Responsibility to Protect and Genocide Prevention. This would be a clear expression of support and commitment to prevent such grave human rights violations from occurring in the future. "Responsibility to Protect and Genocide Prevention"
Being convinced that prevention and punishment of the crime of genocide and mass atrocities is our shared responsibility. Genocide and mass atrocities are a direct assault on universal human values, including most fundamentally the right to life. It is our obligation to create in the 21st century "A world free from genocide and mass atrocities". We pledge to make every effort to stop them. Recalling with deep gratitude the invaluable work of Mr. Raphael Lemkin who coined the word genocide and through his tireless efforts made a milestone contribution to the humanity with the adoption of the Convention on the prevention and punishment of the crime of genocide (1948). Acknowledging that genocide has deep roots and that its execution requires planning and organization. Seizing on opportunities to prevent mass atrocities requires a comprehensive approach, breaking through bureaucratic silos to draw on a wide array of analytical, diplomatic, economic, legal, and military instruments as well as engaging with a variety of partners. It also requires a combination of high-level attention and standing institutional mechanisms. Bearing in mind the European Parliament's recommendation to the Council of 13 June 2012 on the 67th session of the UN General Assembly (2012/2036(INI)), in particular the strong reconfirmation of the EU's commitment to the concept of Responsibility to Protect (R2P) and to initiate the development of an inter-institutional consensus on R2P between the European Parliament, the EEAS and the EU Member States that could ensure a more consistent EU action on such issues in UN forums; to assist states in fulfilling their responsibility to protect their populations; to stress the need for timely and adequate international action to prevent and halt genocide, ethnic cleansing, war crimes and crimes against humanity; and to generate further political and institutional progress on the implementation of the R2P concept in UN organs. Heaving regard the European Parliament's proposal for the recommendation to the Council on the UN principle of the 'Responsibility to Protect' (R2P) of 28 March 2012 (B7‑0191/2012). Welcomes the recent appointment of the EU Special Representative for Human Rights, whose mandate is to enhance the effectiveness and visibility of EU human rights policy. Calls upon the Council to further strengthen the R2P concept, to build upon inter-institutional consensus on R2P jointly with the EEAS, the Commission and the European Parliament and to improve the EU capacities to prevent atrocities. Reiterates the need to closely follow policy planning and capability development in the context of the EU's Common Security and Defence Policy (CSDP) with the goal of creating EU capacities to provide better protection of human rights and to effectively prevent crimes of genocide, ethnic cleansing, crimes against humanity and war crimes. Recommends to the Council to follow the example of the USA and establish the EU Atrocities Prevention Board as an inter-institutional mechanism, which would coordinate and develop new means of preventing genocide and mass atrocities. Recommends to the Council to appoint the EU focal point for R2P and to the Governments of EU Member States to appoint their respective national focal points in order to establish an effective network of information sharing and dialogue on conflict and atrocities prevention.